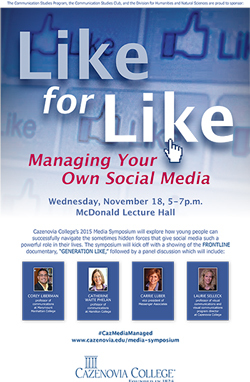 Cazenovia College's 2015 Media Symposium will explore how young people can successfully navigate the sometimes hidden forces that give social media such a powerful role in their lives. The symposium, "Like for Like: Managing Your Own Social Media," will kick off with a 54-minute documentary film, Frontline's "Generation Like." The film follows several teenagers as they become deeply involved with social media and, in some cases, become unwitting marketers for corporate interests, including the film franchise "The Hunger Games." Through extensive interviews, the film also addresses the question, "What happens when the traditional teenage quest for identity and connection occurs online?" Following the film, a panel of four experts, both academic and professional, will expand the discussion of social media's impact through their own particular lenses, from identity formation to branding to seeking and maintaining employment. "Fretting about social media corrupting youth these days risks sounding like an earlier generation of parents wringing their hands over Elvis and the Beatles. Yet 'Frontline' has found a way into the conversation by delving into the insidious way corporate marketers — including Hollywood — have insinuated themselves into the process, turning enthusiastic fans into co-opted marketing minions. 'Generation Like' is a fascinating look into a world where Retweets, Likes and other online endorsements have become social currency, spawning a new breed of consultants unabashedly seeking to take the risk out of public opinion." For more information contact Paul Riede at psriede@cazenovia.edu.